IHC is a valuable tool in the evaluation of splenic disorders. It provides unique challenges, however, because of the functional complexity of the spleen and the variety of its histological components. The purpose of this section is to provide general guidelines on evaluating the complex splenic microanatomy, stressing in particular the morphologic and the immunohistological characteristics of the white pulp and red pulp compartments (44). The lymphoid components will not be specifically discussed. As a functional compartment, the stroma of the spleen is often overlooked. It does, however, give rise to both neoplastic and nonneoplastic proliferations, which may be complex and difficult to evaluate. In addition, the stroma of the spleen may in itself, provide insight into the development of splenic disorders (e.g., myeloid metaplasia). In terms of architecture, the splenic stroma can be divided into three main components: the vascular component, the reticuloendothelial or monocyte/ macrophage component, and the remainder (45). 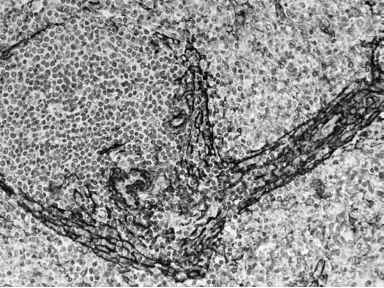 This remaining portion consists of various mesenchymal cells and extracellular matrix (ECM), which forms the structural framework of the spleen. Fig. 22. CD34 expression in small vessels of the spleen. Note that the sinus-lining cells (e.g., littoral cells) are CD34 negative. Fig. 23. Factor VIII antigen staining in a normal spleen. All vascular elements stain with factor VIII antigen. Fig. 24. CD8 staining of littoral cells in spleen. 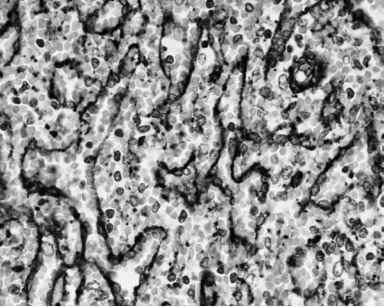 In addition, numerous circulating T-cells of the suppressor type (e.g., CD8 positive) are seen. more difficult. CD8 is only inconsistently positive in the neoplastic counterpart of the sinusoidal endothelium, the littoral cell angioma. 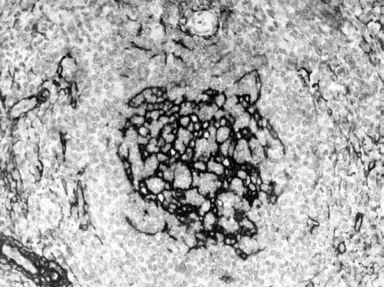 The monocyte/macrophage system (MMS) is one of the more important anatomic and functional components of the spleen; it forms the bulk of the red pulp (cordal macrophages), but often receives little specific attention. Only when there is a significant derangement of the MMS, is it even noticed. Normally, the MMS serves as a functional filter for effete red blood cells and other less than desirable components of the circulating blood. In states in which there is an increase in destruction of circulating blood components, as in an autoimmune hemolytic anemia or immune thrombocytopenic purpura, the cordal macrophages will become engorged and hyperplastic within the spleen producing a picture of red pulp congestion. The cordal macrophages can also become engorged with metabolic products in storage diseases, infectious agents, or even abnormally produced immunoglobulins. Fig. 25. Nerve growth factor receptor (NGFR) staining of red pulp of spleen. NGFR stains stromal elements of the spleen. the case of immunoglobulin accumulation, IHC for K and X light chains may be of benefit. A considerable portion of the spleen (white pulp) is devoted to its function as a lymphoid organ. Components that are notable parts of this are dendritic cells (FDC and IDC). Distinction of dendritic cells is usually accomplished by IHC. Dendritic cells are varyingly positive for monocyte/macrophage-associ-ated markers such as CD68, S100, CD1a, lysozyme and, a-1-antitrypsin (as previously described). Fig. 26. Nerve growth factor receptor (NGFR) staining of white pulp of spleen. NGFR stains dendritic cells of white pulp. Fig. 27. Smooth muscle actin (SMA) staining in normal spleen. SMA highlights cells with myoid differentiation that define the boundaries between red and white pulp. Fig. 28. Collagen type IV staining in normal spleen. This stain highlights the ring fibers of the splenic sinusoids. the splenic sinusoids (Fig. 28). 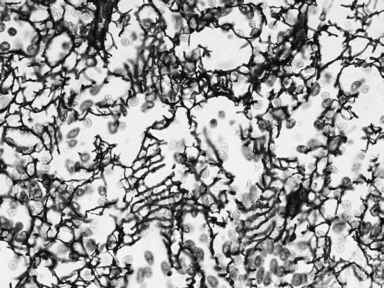 Other types of collagen are collectively stained by Gomori silver impregnation technique also known as reticulin stain. Various patterns of stromal cell hyperplasia or alterations in the architectural distribution of ECM proteins can be observed in a variety of splenic disorders. 1 Rudiger, T., Hofler, H., Kreipe, H. H., et al. (2002) Quality assurance in immuno-histochemistry: results of an interlaboratory trial involving 172 pathologists. Am. J. Surg. Pathol. 26, 873-882. 2 His, E. D. and Yegappan, S. (2001) Lymphoma immunophenotyping: a new era in paraffin-section immunohistochemistry. Adv. Anat. Pathol. 8, 218-239. 3 Warnke, R. A. and Isaacson, P. G. (2001) Immunohistochemical analysis of lymphoid tissue. In: Neoplastic Hematopathology, (Knowles, D. M., ed. ), Lippincott Williams and Wilkins, Philadelphia, PA, 227-253. 4 Gown, A.M. (2004) Unmasking the mysteries of antigen or epitope retrieval and formalin fixation. Am. J. Clin. Pathol. 121, 172-174. 5 Jaffe, E. S., Banks, P. M., Nathwani, B., Said, J., and Swerdlow, S. H. (2004) Recommendations for the reporting of lymphoid neoplasms: a report from the Association of Directors of Anatomic and Surgical Pathology. Mod. Pathol. 17, 131-135. 6 Orazi, A., Cattoretti, G., Schiro, R., et al. (1992) Recombinant human interleukin-3 and recombinant human granulocyte-macrophage colony-stimulating factor administered in vivo after high-dose cyclophosphamide cancer chemotherapy: effect on hemato-poiesis and microenvironment in human bone marrow. Blood 79, 2610-2619. 7 Pinkus, G. S. and Pinkus, J. L. (1991) Myeloperoxidase: a specific marker for myeloid cells in paraffin sections. Mod. Pathol. 4, 733-741. 8 Manaloor,E. J.,Neiman, R. S.,Heilman,D. K., et al. (2000) Immunohistochemistry of routinely processed bone marrow biopsies can be used to subtype acute myeloid leukemia: comparison with flow cytometry. Am. J. Clin. Pathol. 113, 814-822. 9 Orazi, A., O'Malley, D. P., Jiang, J., et al. (2004) Acute panmyelosis with myelofibrosis: an entity distinct from acute megakaryoblastic leukemia. Mod. Pathol. 10, 1-12. 10 Rimsza, L. M., Larson, R. S., Winter, S. S., et al. (2000) Benign hematogone-rich lymphoid proliferations can be distinguished from B-lineage acute lymphoblastic leukemia by integration of morphology, immunophenotype, adhesion molecule expression, and architectural features. Am. J. Clin. Pathol. 114, 66-75. 11 Orazi, A., Cotton, J., Cattoretti, G., et al. (1994) Terminal Deoxynucleotidyl Transferase staining in acute leukemia and normal bone marrow using routinely processed paraffin sections. Am. J. Clin. Pathol. 102, 640-645. 12 Soligo, D., Delia, D., Oriani, A., et al. 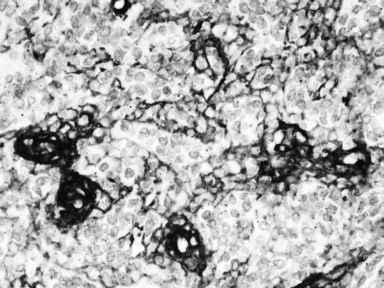 (1991) Identification of CD34+ cells in normal and pathological bone marrow biopsies by QBEND10 monoclonal antibody. Leukemia. 5, 1026-1030. 13 Kotylo, P., Seo, I. S., Heerema, N. A., et al. (2000) Flow cytometric immunophe-notypic analysis of pediatric and adult minimally differentiated acute myeloid leukemia (AML-M0). Am. J. Clin. Pathol. 113, 193-200. 14 Nguyen, T. T., Schwartz, E. J., West, R. B., et al. (2005) Expression of CD163 (hemoglobin scavenger receptor) in normal tissues, lymphomas, carcinomas, and sarcomas is largely restricted to the monocyte/macrophage lineage. Am. J. Surg. Pathol. 29, 617-624. 15 Robertson, P. B., Neiman, R. S., Worapongpaiboon, S., John, K., and Orazi, A. (1997) 013 (CD99) positivity in hematologic proliferations correlates with TdT positivity. Mod. Pathol. 10, 277-282. 16 Orazi,A., Cattoretti, G., Soligo, D., Luksch, R., and Lambertenghi-Deliliers G. (1993) Therapy-related myelodysplastic syndromes: FAB classification, bone marrow histology, and immunohistology in the prognostic assessment. Leukemia 7, 838-847. 17 Baur, A. S., Meuge-Moraw, C., Schmidt, P. M., Parlier, V., Jotterand, M., and Delacretaz, F. (2000) CD34/QBEND10 immunostaining in bone marrow biopsies: an additional parameter for the diagnosis and classification of myelodysplastic syndromes. Eur. J. Haematol. 64, 71-79. 18 Orazi, A., Neiman, R. S., Cualing, H., Heerema, N. A., and John, K. (1994) CD34 immunostaining of bone marrow biopsies is a reliable way to classify the phases of chronic myeloid leukemia. Am. J. Clin. Pathol. 101, 426-428. 19 Orazi, A., Albitar, M., Heerema, N. A., Haskins, S., and Neiman, R. S. (1997) Hypoplastic myelodysplastic syndromes can be distinguished from acquired aplas-tic anemia by CD34 and PCNA immunostaining of bone marrow biopsy specimens. Am. J. Clin. Pathol. 107, 268-274. 20 Contos, M. J., Kornstein, M. J., Innes, D. J., and Ben-Ezra, J. (1992) The utility of CD20 and CD43 in subclassification of low-grade B-cell lymphoma on paraffin sections. Mod. Pathol. 5, 631-633. 21 Chen, C. C., Raikow, R. B., Sonmez-Alpan, E., and Swerdlow, S. H. (2000) Classification of small B-cell lymphoid neoplasms using a paraffin section immunohistochemical panel. Appl. Immunohistochem. Mol. Morphol. 8, 1-11. 22 Saez, A. I., Artiga, M. J., Sanchez-Beato, M., et al. 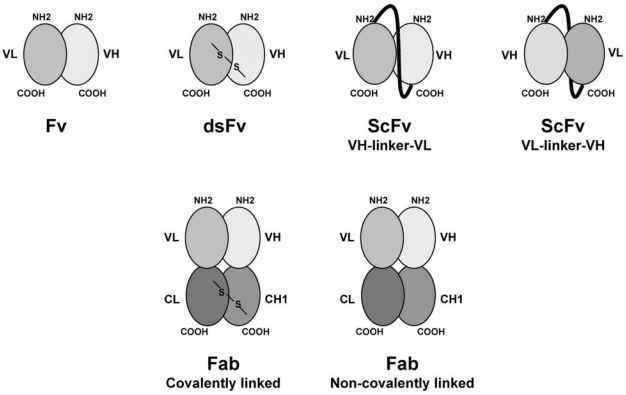 (2002) Analysis of octamer-binding transcription factors Oct2 and Oct1 and their coactivator BOB.1/OBF.1 in lymphomas. Mod. Pathol. 15, 211-220. 23 Torlakovic, E., Torlakovic, G., Nguyen, P. L., Brunning, R. D., and Delabie, J. (2002) The value of anti-pax-5 immunostaining in routinely fixed and paraffin-embedded sections: a novel pan pre-B and B-cell marker. Am. J. Surg. Pathol. 26, 1343-1350. 24 Loddenkemper, C., Anagnostopoulos, I., Hummel, M., et al. (2004) Differential Emu enhancer activity and expression of BOB.1/OBF. 1, Oct2, PU.1, and immunoglobulin in reactive B-cell populations, B-cell non-Hodgkin lymphomas, and Hodgkin lymphomas. J. Pathol. 202, 60-69. 25 O'Connell, F. P., Pinkus, J. L., and Pinkus, G. S. (2004) CD138 (syndecan-1), a plasma cell marker immunohistochemical profile in hematopoietic and non-hematopoietic neoplasms. Am. J. Clin. Pathol. 121, 254-263. 26. Lai, R., Arber, D. A., Chang, K. L., Wilson, C. S., and Weiss, L. M. (1998) Frequency of bcl-2 expression in non-Hodgkin's lymphoma: a study of 778 cases with comparison of marginal zone lymphoma and monocytoid B-cell hyperplasia. Mod. Pathol. 11, 864-869. 27 Dogan, A., Bagdi, E., Munson, P., and Isaacson, P. G. (2000) CD10 and BCL-6 expression in paraffin sections of normal lymphoid tissue and B-cell lymphomas. Am. J. Surg. Pathol. 24, 846-852. 28 King, B. E., Chen, C., Locker, J., et al. (2000) Immunophenotypic and genotypic markers of follicular center cell neoplasia in diffuse large B-cell lymphomas. Mod. Pathol. 13, 1219-1231. 29 Ohshima, K., Kawasaki, C., Muta, H., et al. (2001) CD10 and Bcl10 expression in diffuse large B-cell lymphoma: CD10 is a marker of improved prognosis. Histo-pathology 39, 156-162. 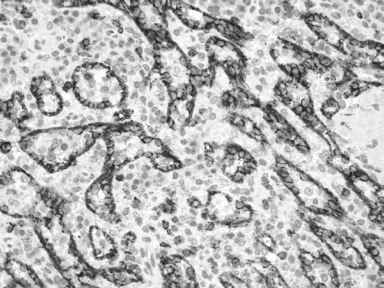 30 Orazi, A., Cattoretti, G., John, K., and Neiman, R. S. (1994) Terminal deoxy-nucleotidyl transferase staining of malignant lymphomas in paraffin sections. Mod. Pathol. 7, 528-586. 31 Stein, H., Foss, H. D., Durkop, H., et al. (2000) CD30(+) anaplastic large cell lymphoma: a review of its histopathologic, genetic, and clinical features. Blood 96, 3681-3695. 32 Miller, T. P., Grogan, T. M., Dahlberg, S., et al. (1994) Prognostic significance of the Ki-67-associated proliferative antigen in aggressive non-Hodgkin's lymphomas: a prospective Southwest Oncology Group trial. Blood 83, 1460-1466. 33 Budke, H., Orazi, A., Neiman, R. S., Cattoretti, G., John, K., and Barberis, M. (1994) Assessment of cell proliferation in paraffin sections of normal bone marrow by the monoclonal antibodies Ki-67 and PCNA. Mod. Pathol. 7, 860-866. 34 Brown, D.C. and Gatter, K. C. (2002) Ki67 protein: the immaculate deception? Histopathology 40, 2-11. 35 Segal, G. H., Stoler, M. H., and Tubbs, R. R. (1992) The "CD43 only" phenotype. An aberrant, nonspecific immunophenotype requiring comprehensive analysis for lineage resolution. Am. J. Clin. Pathol. 97, 861-865. 36 Lai, R., Weiss, L. M., Chang, K. L., and Arber, D. A. (1999) Frequency of CD43 expression in non-Hodgkin lymphoma. A survey of 742 cases and further characterization of rare CD43+ follicular lymphomas. Am. J. Clin. Pathol. 111, 488-494. 37 Boudova,L.,Torlakovic,E.,Delabie,J., et al. (2003) Nodular lymphocyte-predominant Hodgkin lymphoma with nodules resembling T-cell/histiocyte-rich B-cell lymphoma: differential diagnosis between nodular lymphocyte-predominant Hodgkin lymphoma and T-cell/histiocyte-rich B-cell lymphoma. Blood 102, 3753-3758. 38 von Wasielewski, R., Mengel, M., Fischer, R., et al. (1997) Classical Hodgkin's disease. Clinical impact of the immunophenotype. Am. J. Pathol. 151, 1123-1130. 39 Pittaluga, S., Wlodarska, I., Pulford, K., et al. 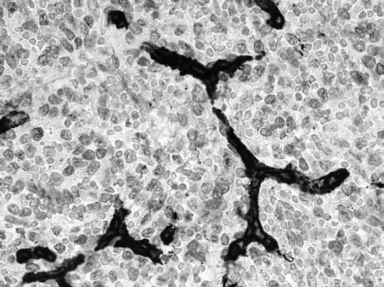 (1997) The monoclonal antibody ALK1 identifies a distinct morphological subtype of anaplastic large cell lymphoma associated with 2p23/ALK rearrangements. Am. J. Pathol. 151, 343-351. 40 ten Berge, R. L., de Bruin, P. C., Oudejans, J. J., Ossenkoppele, G. J., van der Valk, P., and Meijer, C. J. (2003) ALK-negative anaplastic large-cell lymphoma demonstrates similar poor prognosis to peripheral T-cell lymphoma, unspecified. Histopathology 43, 472-469. 41 O'Malley, D. P., Vance, G. H., and Orazi, A. (2005) Chronic lymphocytic leukemia/small lymphocytic lymphoma with trisomy 12 and focal cyclin d1 expression: a potential diagnostic pitfall. Arch. Pathol. Lab. Med. 129, 92-95. 42 Sanchez-Beato, M., Sanchez-Aguilera, A., and Piris, M. A. (2003) Cell cycle deregulation in B-cell lymphomas. Blood 101, 1220-1235. 43 Colomo, L., Lopez-Guillermo, A., Perales, M., et al. (2003) Clinical impact of the differentiation profile assessed by immunophenotyping in patients with diffuse large B-cell lymphoma. Blood 101, 78-84. 44 Neiman, R. S. and Orazi, A. (2001) Histopathologic manifestation of lymphopro-liferative and myeloproliferative disorders involving the spleen. In: Neoplastic Hematopathology, 2nd ed., (Knowles, D. M., ed. ), Williams and Wilkins, Baltimore, MD, 1881-1914. 45 van Krieken, J. M. and Orazi, A. (2006) Spleen. In: Histology for Pathologists, 2nd ed., (Sternberg, S. S., ed. ), Lippincott-Raven Publishers, Philadelphia, PA, in press.